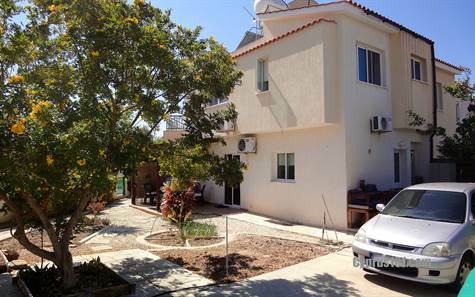 Kissonerga, Paphos - This character 3 bedroom end townhouse is situated on a large corner plot in a quiet village street in Kissonerga. The property is within easy walking distance to local amenities and to the beach. The ground floor features an open plan living room with lounge, dining area and end kitchen with breakfast bar. The kitchen is well equipped with granite worktops, built-in oven, electric hob and extractor fan, fridge/freezer and washing machine. To the side is a guest cloakroom and useful storage cupboard. Upstairs are three double size bedrooms with fitted wardrobes. One bedroom has an en-suite shower room and private balcony with lovely rural views. The bathroom is accessed directly from the landing where there is a large fitted cupboard. The plot size is amazing and there is lots of outside space. Patio doors off the living room provide easy access to a private courtyard garden and to a larger landscaped garden with pergola. A long driveway provides parking for 3/4 cars. The property has loads to offer - a peaceful village location and yet not far from amenities, a large plot with scope to add a swimming pool if required and very well maintained accommodation. Please refer to MLS#: 1390 when inquiring.